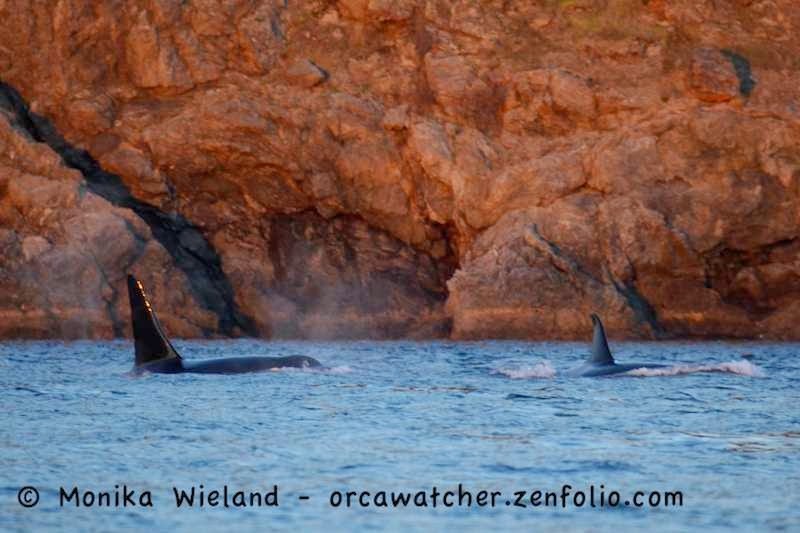 Last year, we were treated to a superpod traveling past Lime Kiln on Thanksgiving Day. This year, it sounded like the Puget Sound area would be treated to the same thing. 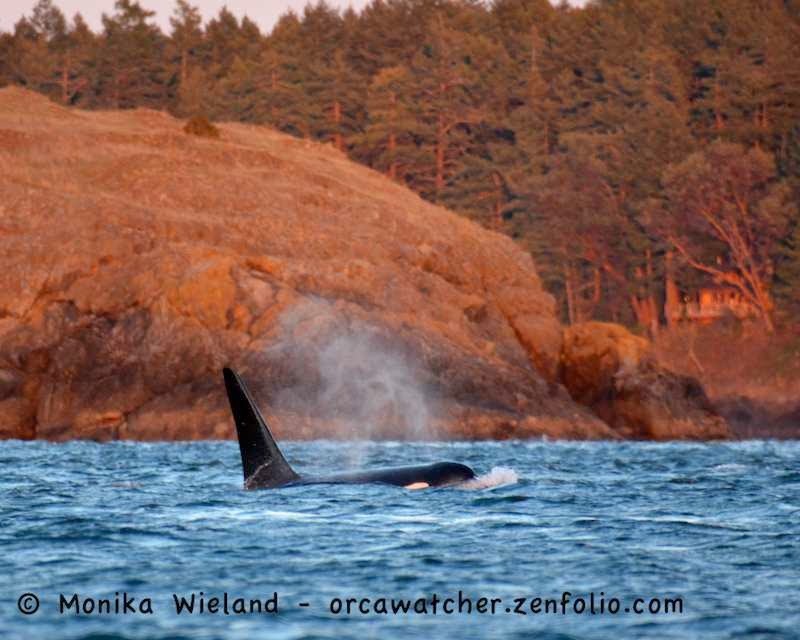 On the day before Thanksgiving, all 78 members of the Southern Resident Community were documented heading east from Victoria and then south towards the Sound. 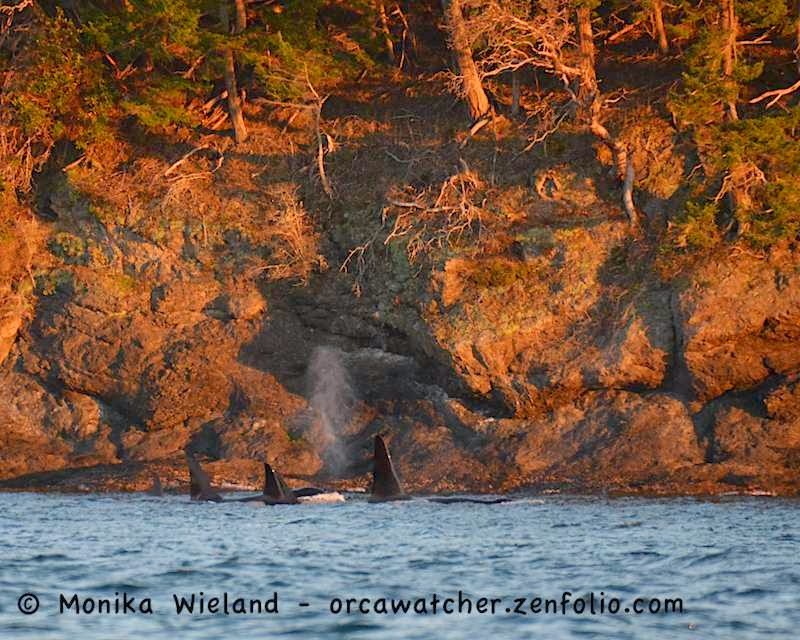 The whales did indeed spend Thanksgiving and the day after traveling around Puget Sound in several groups, but by Saturday we had reports of orcas around the San Juan Islands, too! At first, it sounded like transients. When I heard from a friend they were heading towards Reuben Tarte County Park, I headed out to take a look. With strong northeast winds, San Juan Channel was solid white caps. I wasn't sure if the whales were still coming or had already past, but I stood out there in sub-freezing temps and high winds scanning for about 15 minutes. Just about the time I couldn't feel my hands anymore, I spotted something that looked more like a whale splash than a white cap. Keeping my eyes trained on the spot, I spotted what I thought was a blow. I was just on my way home from getting groceries, and of course it was one of the rare times I didn't have my camera or binoculars with me, but a few minutes later I was sure. 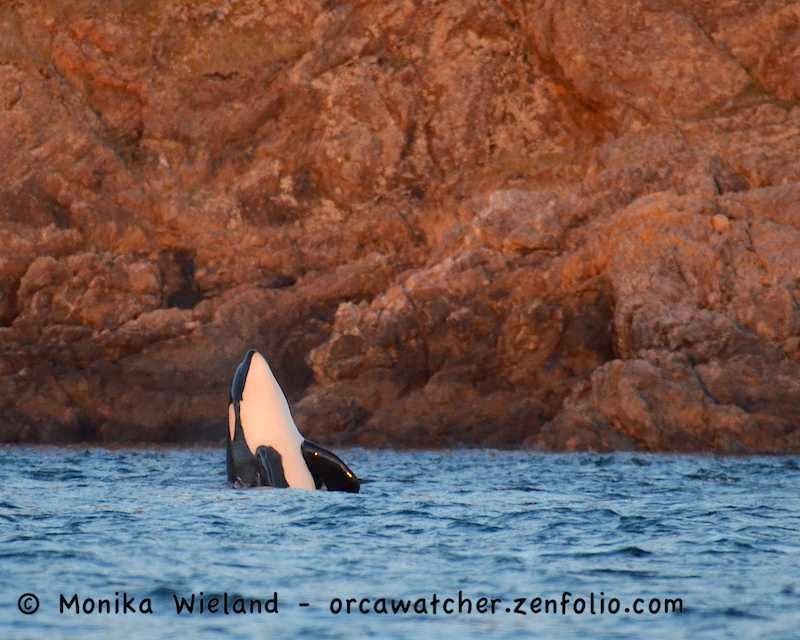 It was definitely orcas! Once they started making their way north, they passed me by in a hurry. It looked like a group of about half a dozen animals traveling tightly together with an adult male trailing behind them. 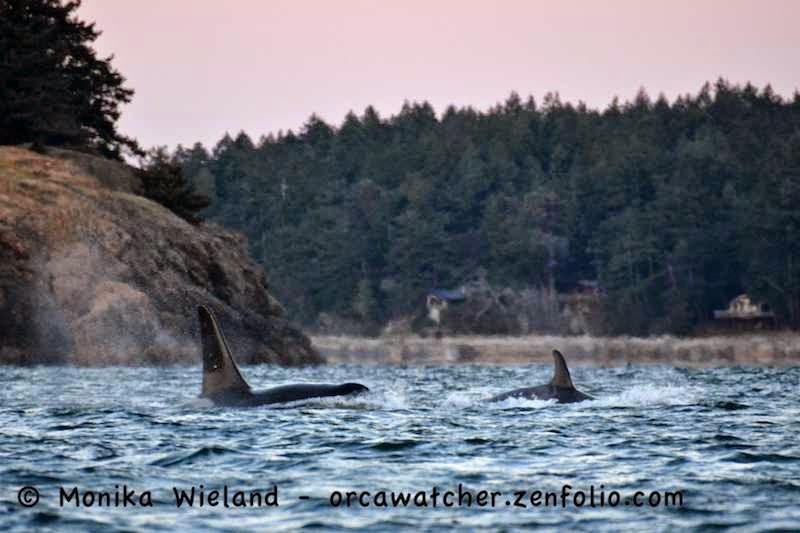 It was tough to see any saddle patches in the choppy water, but something about them felt more like residents than transients, though with orcas having been spotted in Deer Harbor and Westsound earlier, transients seemed a lot more likely. I didn't see any more coming, however, and was so cold, that I had to give it up after I lost them in the rough seas as they continued north. I heard a little bit later, however, that a second group of about as many animals followed behind them - now I was pretty convinced they were residents! A bit later I got confirmation from another friend who had picked them up - J-Pod and K-Pod! The unofficial San Juan winter whale watchers were in full alert mode, with everyone giving each other updates as best we could to make sure everyone got a chance to see the whales. When I heard they went west through Spieden Channel, my thoughts immediately went to taking the boat out. I was afraid it was too windy after the water conditions I saw at Reuben Tarte, but I went to look on the west side and was pleasantly surprised by how calm it was - the wind was coming from the opposite side of San Juan Island. The timing ended up working out perfectly for a visiting friend of mine and I to jump out and pick up K-Pod just off Henry Island before sunset. 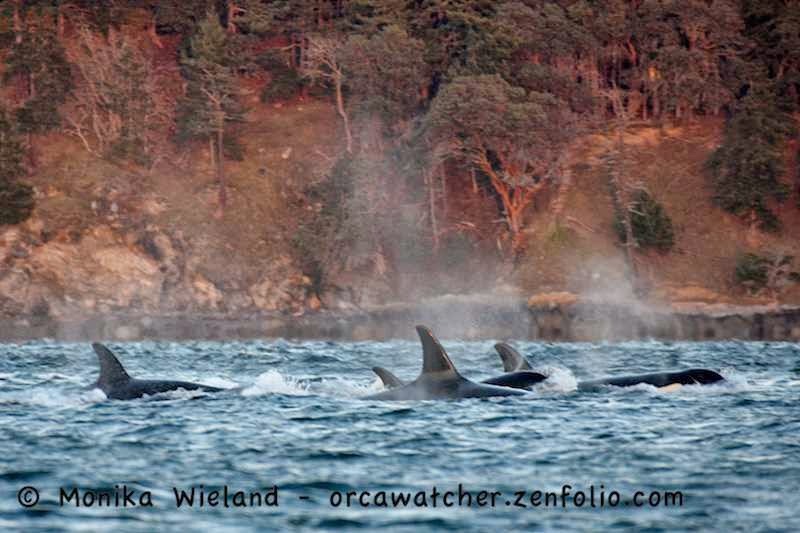 By this point, J-Pod had disappeared somewhere, perhaps having gone north. We had all of K-Pod traveling together in two large groups. The boat is so low to the water that I've actually had a bit of a hard time getting my photos in focus! The lighting was so pretty, though, that I just snapped away and hoped for the best, and did get a few to turn out! My favorite shot of the short encounter! All too soon, the sun went down. The light changed quickly and, already cold, it suddenly got a lot colder! We let them pass us by and then headed back to port. It was short, but especially this time of year, so sweet!